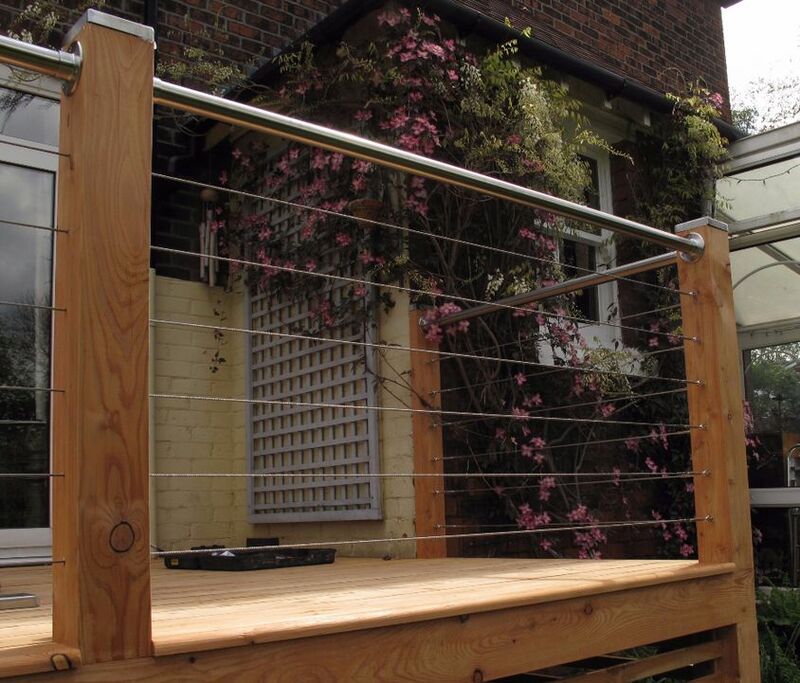 Our post-to-post wire systems are not only easy to fit, but offer an affordable solution to providing infill to decking and patio areas. Using 4mm diameter 316-grade wire and fittings our infill wires are easy and quick to fit. Wires are secured to the timber end posts using wood screw threaded eyes at each end - the infill wires are then connected to these via a fork terminal one end and turnbuckle/fork terminal at the other. Wires are made up to the inside-of-post-to-inside-of-post dimensions and the forks and turnbuckle tensioners are pre-fitted to the wire in our workshop. Tensioning of the wire is achieved by simply rotating the body of the turnbuckle to pull the wire tight (approx 40mm of adjustment is available). 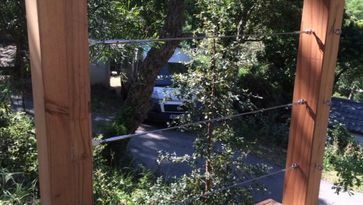 Wires can easily be passed through any intermediate posts by disconnecting the turnbuckle body and passing the threaded wire end through a 8mm hole drilled in the post. 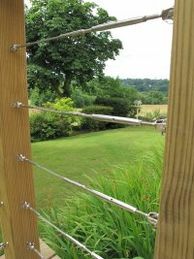 To make up wires for your decking, all we require is the distance from the inside face -to-inside face of the end posts. The tensioners have around 50mm of adjustment available. Once we have the required dimensions, Bollin Rigging will usually be able to deliver the wires to you within 3 days of your order. Each wire requires a fitting and tensioning kit - fork and turnbuckle adjuster fittings are pre-swaged to the wires to your measurements (there is approximately 30mm to 50mm of adjustment available allowing a degree of latitude in your measurements). Two wood screw eye bolts are provided to fix to the posts at each end. Simply add the number of meters of wire required to the cost of the fitting kit to give the total price per wire. The above prices include VAT at 20% but exclude delivery. Delivery via Parcelforce 24 costs £6.95 but is free on orders over £250.00 - Smaller consignments will be sent out by post and charged at cost. Due to the use of eyes at the top and bottom of our balustrades, our wires easily follow the line of any staircase or other design. The finished balustrade allows an unrestricted but safe view. Please note that while we are happy to advise on design and choice of materials, it is up to the customer to ensure that any balustrade or components supplied comply with local building regulations should these relate to the proposed installation.